The SYNC1500 was created to allow for both high board (or channel) count synchronized A/D and D/A systems as well as increased system scalability. With the SYNC1500 card module, synchronized channel record or playback systems are no longer bound to single chassis configurations and can span multiple chassis, which allows for significantly greater I/O and processing resources versus a single chassis system. The SYNC1500 provides clock and trigger distribution for up to 5 data acquisition and arbitrary waveform generator boards. When utilized in conjunction with the Signatec PX1500-4 for example, a system can be mechanized incorporating up to 20 channels of fully synchronized, very high-speed data acquisition. 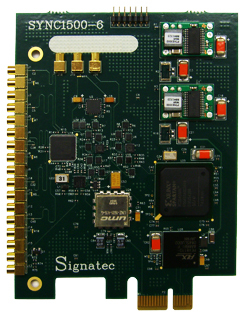 The SYNC1500 board is designed for PC systems and utilizes a single lane PCI Express bus (PCIe) Gen1 interface. This PCIe Gen1 x1 interface is plug-in compatible with all PCIe lane configurations (x1, x4, x8 and x16). An onboard frequency synthesized clock allows the output clock rate to be set to any value from 25 MHz to 1500 MHz, offering maximum flexibility for clock rate selection. The synthesized clock is locked to an onboard 10 MHz reference clock and is used in conjunction with the phase lock loop (PLL) to maintain the desired internal clock rate. An externally provided 10 MHz reference and/or an external clock input can also be selected.